All golfers want to be able to hit the long ball. It is a lot of fun knowing you can walk up to the tee box and out drive your friends by 10, 15, or 30 yards. It lets everybody know that you are a serious golfer. What you do from your second shot to the cup is a different story. Our society nowadays has put so much emphasis on getting the right equipment to get you that extra yardage off the tee. We are sold on the idea of dropping $300 on a new driver and paying big dollars for a dozen Titelist Pro V1 Golf Balls. I am not going to say that the technology does not help. I for one love the Taylor Made R5 Draw Driver I picked up a couple years and noticed better control and a 10 yard gain off the tee. The reality is that spending $300 on one new club and $30 for a new set of balls is not practical for the person who golfs even once a week. A new club is not going to solve the problem of not hitting farther, losing energy through the round, or feeling stiff with your swing. The problem comes back to the operator. Its not the clubs, it’s you. If you do not spend time working on you then the latest and greatest $300 golf club is not going to solve anything. This is where P90X comes in. When I started doing P90X I was a decent golfer. My handicap hovered in the 13-18 range for 18 holes. There was not a part of a game that was better than others. My average drives were around 230 yards. While doing P90X I could feel my body getting stronger in areas that I previously never worked out like my back, legs, shoulders, and core muscles. Core muscles are not just abs, they are the area from your knee caps to your chest. Of course all of those muscles are the major muscle groups used in a golf swing. The pull ups, chin ups, push ups, lunges, ab workouts, yoga, and more challenged my body like it has never done before. My favorite one was P90X Legs and Back. Not only could I feel the results I could see them. The best part was about to come. I live in Michigan and you can only golf from maybe late March til November. I started P90X in late January 2008. Golf was not on my mind yet. All I did was put in a different P90X DVD six days a week and went about my business. Then came my first time out at the course with my brother. Our fraternity from college has a spring golf outing at the Pohlcat in Mount Pleasant, MI. I was excited to see some old friends and ready for a good time. The good times started at the first tee. It was my time to tee off with my new found P90X strength. I pushed it a little harder the week leading up to it because there was some pride involved with the day. I absolutely crushed that drive. The sound it made leaving the club left a ringing sound in my ear. It cleared the bunker down the left hand side of the fairway which is 279 to carry it. Click Here To Verify Hole #1. I was amazed and my brother was shocked. It was by far the farthest I have ever hit a golf ball. The rest of the day was more of the same. In the 90 days leading up to the outing I was able to gain enough muscle to put 50 yards on my drive with the same club I had the summer before. Yes, 50 yards. Thanks to P90X. What I remembered the most about that day and now with every time I go golfing is the second shot. Instead of hitting a 4-6 iron on a 440 yard Par 4 for my second shot I am now taking a 7-9 iron. Like most people, those are my money clubs. I can pretty much hit those with my eyes closed and know that its going to be accurate. The distance has transferred to my irons and fairway woods giving me the opportunity to “go for it” sometimes but more importantly giving me the confidence to know that I can at least get it there. This is one of those times when you say “I wish I would have done this when I was younger” because I played golf for my high school and who knows where it would of taken me if I was in better shape. My scores have dropped by about 7 shots for 18 holes just because of my ability to hit the long ball now. I’m not going to lie, if I think I can get it there I am going to try. Never had the power before to do it. Accuracy is still something I need to work on as it still is a game of being consistent. Over a season I probably golf 15 times which is not a lot. To see that my scores have dropped by 7 strokes on average without practicing is pretty good. If there was more time to spend at the driving range working on other things besides hitting the crap out of the ball I might think about getting into tournaments again. Then all I really need to do is get my new yardages down with each club. Technology is great but its not the end all cure. Your body is the answer. My golf game has improved dramatically by doing P90X. With it being a total body program it has helped in all areas. 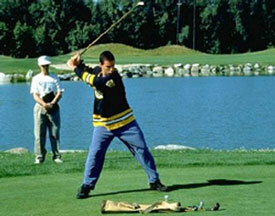 As most people know, a good golf swing is about being consistent and balanced. Then you tweak it from there with practice. Don’t spend a ton of money on new clubs every other year when you should be making a investment in your body. Get started with the P90X workout and your golf game will improve.